Pickersdane is an historic Grade II listed four-bedroom country house in an idyllic rural location close to Ashford in Kent. Dating from the mid-16th century the house was built in typical Kentish vernacular. Period features remain in the spacious house, including mullioned windows, brick and inglenook fireplaces, exposed beams and wall timbers. Accommodation in total includes entrance hall, sitting room, family room, kitchen/dining room, office, cloakroom, and four bedrooms upstairs, plus the family bathroom. The annexe is situated a little way from the house and was converted by the current owners to provide additional accommodation. Clad in rambling roses and honeysuckle, it offers two bedrooms on the first floor and a large open plan reception and fitted kitchen downstairs. Outside, the main garden lies to the rear of the house and has a stream with a bridge over, and various grass pathways are cut through the downland pasture with wild flowers, roses and herbaceous beds; the grounds come to around 1.5 acres. 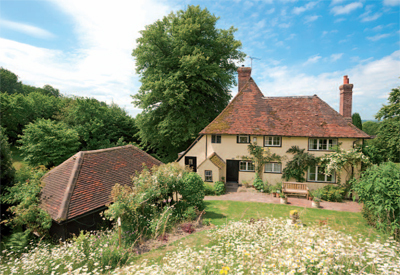 Pickersdane is situated in an Area of Outstanding Natural Beauty at the foot of the North Downs and just north of the hamlet of Brook close to Wye, an attractive village with good local amenities. Ashford is six miles (St Pancras 37 minutes) and Canterbury is 15 miles. The guide price is £925,000. For further information please contact Strutt & Parker on 01227 473 707 or visit www.struttandparker.com.